SUGRU, stick it, shape it, workable for 30 minutes and in 24 hours it will turn into rubber. From fixing things to creative projects, Sugru makes thousands of small DIY jobs around the home easy and fun. Temperature resistant from -50°C (-58°F) to +180°C(356°F). Electrically insulating – for low voltage consumer electronics below 24 volts, like USB cables and phone chargers. No related products for the SUGRU Mouldable adhesive. No key features selected for the SUGRU Mouldable adhesive. No quantity discount for the SUGRU Mouldable adhesive. 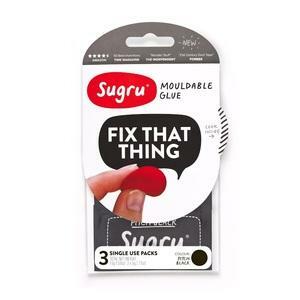 Be the first to submit a review for the SUGRU Mouldable adhesive.